Antonio Citterio was born in Meda in 1950, started his design office in 1972, and graduated in architecture at the Milan Polytechnic in 1975. Between 1987 and 1996 he worked in association with Terry Dwan designing buildings in Europe and Japan. In 1999, with Patricia Viel, he founded "Antonio Citterio and Partners" (changed to "Antonio Citterio Patricia Viel and Partners" in September 2009). The office operates at international level developing projects like urban plans, residential and commercial complexes, conservative restructuring of public buildings and planning of spaces for work, offices, showrooms and hotels. In 1987 and in 1994 Antonio Citterio he was awarded the Compasso d'Oro-ADI. 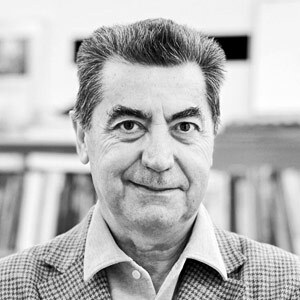 Since 2006 he has been full professor of Architectural Design at the Mendrisio Academy of Architecture (Switzerland). In 2008 he was honoured with the title of Royal Designer for Industry by the Royal Society for the Encouragement of Arts, Manufactures & Commerce of London.